Ironing isn’t on top of my list of Fun Things To Do, but I’ve since found out there are lots of interesting uses for an iron! Whether you want to cook, or be creative, check out the list below and give it a whirl. If you’re a fan of bacon but haven’t got a pan or oven to cook it in, reach for your trusty iron. Wrap those rashers in some foil and use the iron to heat the precious package up thoroughly. Be sure to use a towel or tea towel underneath so as not to damage any surfaces. Enjoy the smell of bacon! Here’s an interesting use for an iron! If you’re sat in a hotel room, hungry and lacking a sandwich press then don’t worry, there’s no need to panic. Grab your panini, wrap it in foil and then use an iron to heat it up. Easy. Had an accident with some candle wax? Don’t panic! Place the offending item in the freezer and leave it in there for around thirty minutes. Next, remove the fabric and use a knife to scrape off the cold wax. Place a paper bag over the wax, find your iron and set it to a low heat. Run the iron over the bag on the remaining wax and the paper will absorb what’s left. Finding chewing gum on your clothes is SO ANNOYING. Fret not, Expert Home Tips fans, we have found a solution for you, from Persil. Place a piece of clean cardboard on a flat surface, then place the item of clothing gum-side down on top. Set the iron to medium and iron the garment on the back. Once the gum becomes softer, it should stick to the cardboard. Finally, peel your clothing away and the gum should be left behind on the cardboard. Well, this looks like magic. If your poor wooden table has suffered from heat stains, place a tea towel down on the stain and circle it over the table. Lift off the tea towel and rub the table with a cloth quickly. The stains will vanish! One of the greatest things in life is a love cheese toastie. If any of you have read my other blog posts – and if not, why not? – you’ll know that I’m a big fan of cheese. If you’ve accidentally dropped something on your wooden coffee table and left a big horrible dent, then it’s time to pick up your iron again. Wet the dent and place a damp paper towel over it. Turn the iron to a hot setting and in circular motions, move it over the dent for a few minutes. Check to see if the dent is decreasing intermittently and add more water until the dents have risen up. I remember flower pressing as a child with a wooden contraption with metal screws. Who knew you could do it with an iron? Place your chosen flowers between two sheets of wax paper and press the petals down. Now you can preserve both your flowers and the memory of the occasion. 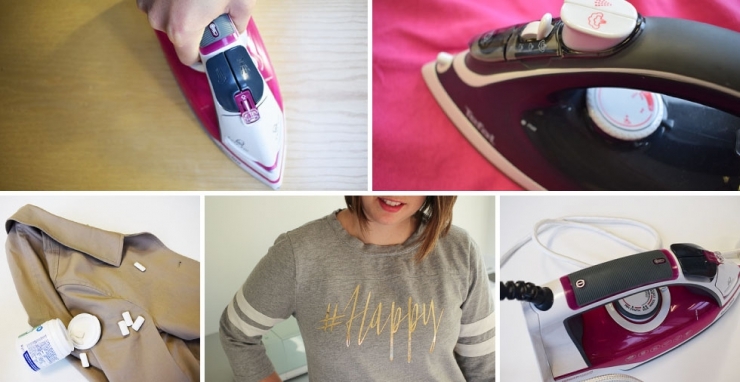 Use your iron in a creative way! Handmade in the Heartland has made a professional looking graphic t-shirt at home. I’ve located some on Amazon from Thermoweb and Ice-Tees if you want to give it a try for yourself.